The Microsoft UK has officially launched Lumia 735. The new Windows Smartphone will be out for sale from 2nd October on next month. The Phone is mainly popular for its Selfie focused camera. The tech giant Microsoft has mentioned that the Smartphone will be available in the contract and it would be starting at £19.99 ($32). While an unlocked price was not revealed, but according to some of reports which claimed that the Lumia 735 will be available in United Kingdom at a price of Eur0 220 which roughly near around $360. The Lumia 735 will be the first handset in the country that offers a beta version of Cortana out of the box and also supports 4G-LTE network support. The Lumia 735 comes with a 4.7-inch 720p ClearBlack display which is empowered by 1.4 GHz quad-core Snapdragon 400 CPU that is coupled wioth 1 GB RAM. The Microsoft provide 8 GB internal storage which is further expandable with the help of MicroSD card up to 128 GB. The Nokia Lumia is packed with 6.7 MP camera with LED flash at the back panel of the Phone which also a Carl Zesis lens which is good for low light photography. And on the front side the Lumia 735 has a awesome 5 mega-pixel front camera which is highlight of this Windows Smartphone. And for the connectivity puropse it has Wi-Fi 802.11 b/g/n, LTE Category 4 connectivity, Bluetooth 4.0, NFC option. 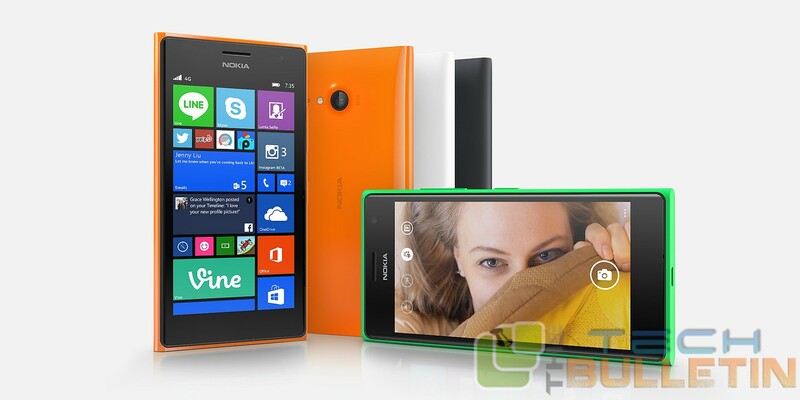 The Lumia 735 has a 2,220 mAh battery along with Windows Phone 8.1 and a Lumia Denim update to boot. It is a single SIM Smartphone where as its other variant Lumia 730 is dual SIM with 3G variant Smartphone and it will be available in the Asia-Pacific region in the mid of October of this year 2014.